When buyers select moonstones, they look for three key factors: bodycolor (background color) and color and orientation of the sheen. Moonstones range in appearance from semitransparent to opaque and colorless to white, with a blue, silver, or white adularescent effect. 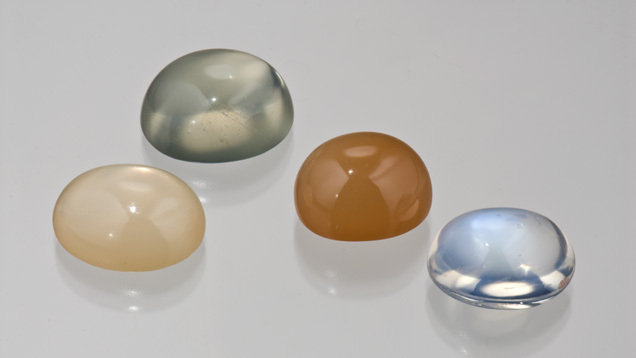 Moonstone bodycolors vary widely. They can be green, yellow to brown, or gray to nearly black. 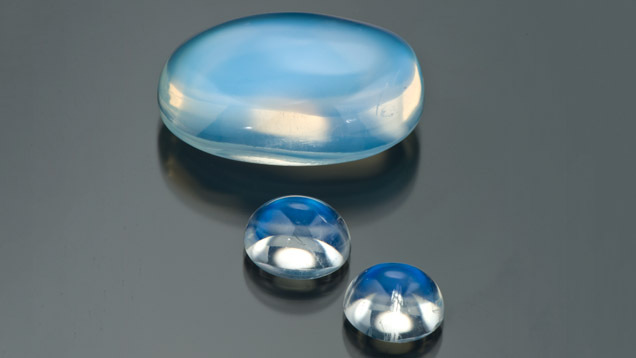 Along with adularescence, some moonstones show chatoyancy, also called the cat’s-eye effect. A few show four-rayed stars in an effect called asterism. 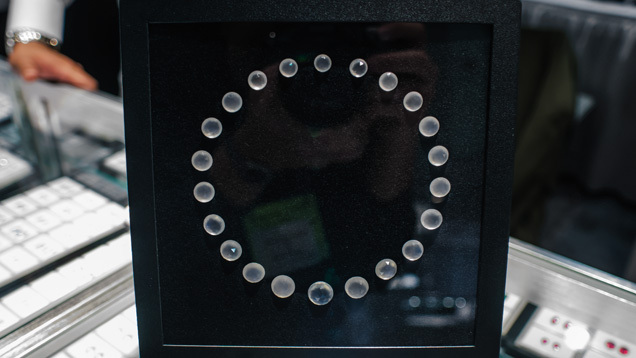 Throughout its long history, people have agreed on the qualities that the most highly favored moonstones should display: a colorless, semitransparent to nearly transparent appearance without visible inclusions, and a vivid blue adularescence, known in the trade as blue sheen. The finest moonstone is a gem of glassy purity with a mobile, electric blue shimmer. Bodycolor should be nearly colorless and free of any yellowish, brownish, or unattractive green tints. Adularescence should, ideally, be blue. The sheen should be centered on the top of a cabochon, and it should be easily seen from a wide range of viewing angles. If a moonstone’s adularescence is only visible within a restricted viewing range, its value drops. Moonstone can be found in a variety of bodycolors. In 1997, miners in Southern India discovered a new type of moonstone with a bright green bodycolor, described as “parrot green” by the trade. Moonstone’s signature adularescence floats in this sea of green. The gem also displays a light yellow pleochroism, a term used for a display of different colors in different crystal directions. Today’s popular moonstone color variety includes orange to yellow colors called peach. 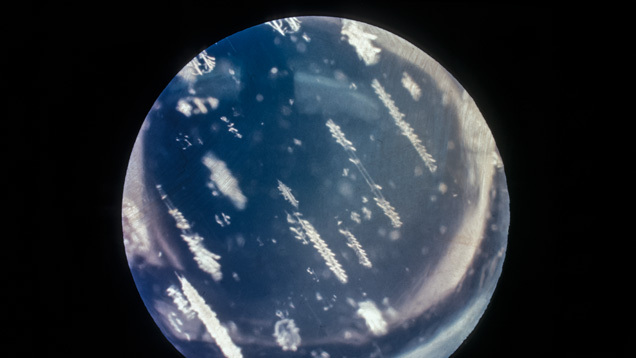 The most-typical moonstone inclusions are stress cracks that gemologists call centipedes. 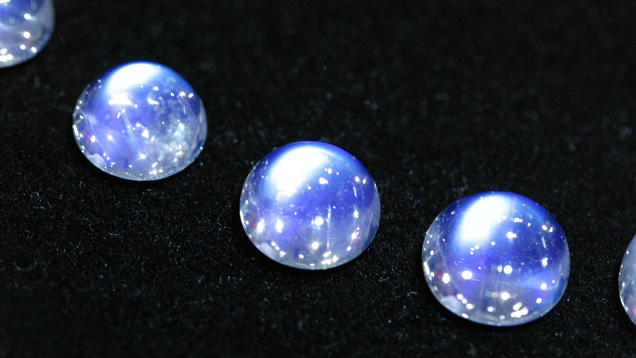 If a moonstone is cut as a cabochon, the dimensions should be uniform, and the profile shouldn’t be too flat. Very flat cabochons don’t display sheen well and have little value. Faceted moonstones have become increasingly common. The cut heightens brilliance and tends to hide any inclusions that might be present. This unusual moonstone suite employs the rose cut, a style most often seen in antique diamond jewelry. 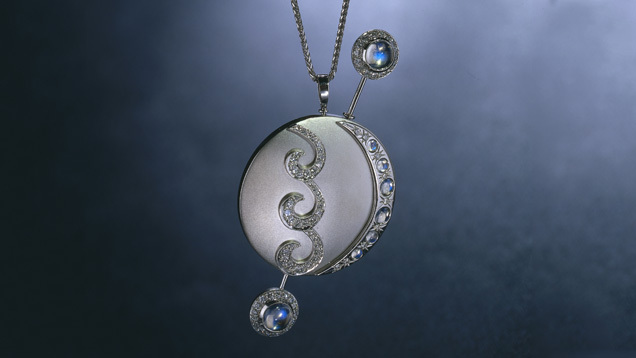 - Courtesy Akiva Gill Co.
Moonstone is popular for carving into decorative jewelry elements, such as cameos or the popular “man-in-the-moon” face that plays on the gem’s name. The uneven surface of the carving combines with the shifting adularescent sheen to create a delightfully intricate and lively effect. Large fine moonstone is very rare, making it relatively valuable.